A road sign welcomes people to the town of Deir al-Zor in Syria September 20, 2017. Picture taken September 20, 2017. BEIRUT - U.S.-backed militias said they captured Syria’s largest oil field on Sunday, pressing their assault against Islamic State in the east of the country. 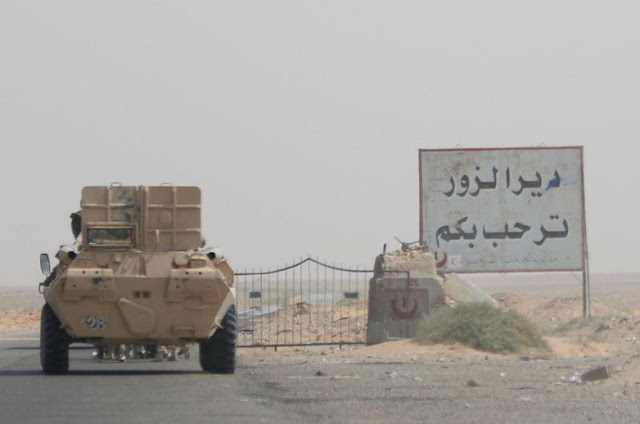 The Syrian Democratic Forces (SDF) said they took al-Omar field on the eastern bank of the Euphrates river in the early hours. “Our forces managed to liberate the fields without notable damages,” said Lilwa al-Abdallah, spokeswoman for the offensive in Deir al-Zor province. The jihadists holed up in buildings in a nearby district, where the SDF was trying to hunt them down, she said. With U.S.-led jets and special forces, the SDF has been battling in Deir al-Zor bordering Iraq. The alliance of Kurdish and Arab militias has focused on territory east of the river, which bisects the oil-rich province. The Syrian army, with Russian air power and Iran-backed militias, has been waging its own separate offensive against Islamic State, mostly to the west of the river. The U.S.-led coalition and the Russian military have been holding deconfliction meetings - to prevent clashes between planes and troops - though the two offensives have sometimes come into conflict. Islamic State has lost vast territory across Syria, and has now come under attack in its last footholds in a strip of the Euphrates valley and the desert in Deir al-Zor. The SDF declared victory over the jihadists in their former headquarters in Raqqa city this week. SDF fighters would now move to the frontlines in Deir al-Zor, speeding up the battle in eastern Syria. Last month, the Kurdish-led militias captured a major natural gas field upstream of Sunday’s advance. Al-Omar oil field lies some 10 km (6.21 miles) north of the town of al-Mayadin, which government troops and their allies took earlier this month. The town had turned into a major base for Islamic State militants after the U.S.-backed offensive drove them out of Raqqa. The Syrian Observatory for Human Rights said Islamic State fighters who had withdrawn from the oil field mounted a counter-attack overnight against government forces. The militants made some gains around al-Mayadin, the Britain-based monitor said. But a Syrian military source denied this, saying there was no significant attack and fighting raged on at the same pace. Any attack by the Islamic State militants there was a “desperate attempt”, the source said. “The Syrian Arab Army is attacking, hitting Daesh positions...and advancing,” the source said, using the Arabic acronym for Islamic State. U.S.-backed militias said they captured Syria’s largest oil field on Sunday, pressing their assault against Islamic State in the east of the country. The Syrian Democratic Forces (SDF) said they took al-Omar field on the eastern bank of the Euphrates river in the early hours. “Our forces managed to liberate the fields without notable damages,” said Lilwa al-Abdallah, spokeswoman for the offensive in Deir al-Zor province.